Sometimes, it’s really hard to extract much juice from local dayap, biasong or limes. This is what I suppose is called a “lateral cut” and it seems to aid in getting the most juice from small dayap or key limes. Commenters mentioned this in recent posts on ceviche/kinilaw, and I had taken a photo at the beach of precisely that cut so I could do a quick tip post… At any rate, I didn’t quite make the best lateral or what I like to refer as “face” cuts, (there’s one good one to the right of the photo) but this does really seem to result in the extraction of more juice than the classic cut into two halves that is typically used for lemons and oranges. 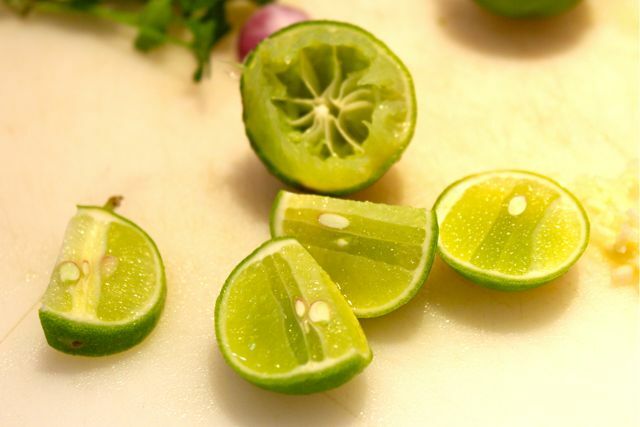 I used to see this cut in Indonesia when they served limes as an accompaniment to their wonderful soups and other dishes, so we have taken to serving limes tableside cut this way. Remove the seeds before serving. You don’t seem to need to do this to big western limes. Maybe half a minute or so in a microwave will also help in extracting more juice from limes, the same way as it works with lemons? THAT is the “tangential” cut I remember being referred to in the comments from an MM psot from a few years back. I still don’t remember who called it that. nice tip! :) very handy esp. when extracting for calamansi juice. i know what you mean, MM….what’s a seemingly simple slice, i can never do right! and to think that thais and vietnamese and most of southeast asia do this practically everyday. well, that’s probably the same way westerners feel about slicing mangoes – most of them can never get the sides right. kasseopeia, here is the precise exchange in the comments section you are referring to, between chef Chris B and Apicio, from 4 years ago (amazing memory). You’re welcome MM and thank you for the calamansi marmalade. The dayap sure looks at home in your silver bowl! Btw, to maximize the amount of juice you get from dayap, cut them lenghtwise off center so you get 3 “pisngi” slices and the core- much in the same way you cut a mango (as opposed to cutting it cross wise like a lemon). I honestly was taken by surprise by your claim in your earlier dayap posts that our native dayap and key limes are the same. A pound of key limes in cute green netting bags from Mexico have become available in Toronto these last couple of years and although I have not made any price comparison against Persian limes and lemons which are both more readily available here, key limes are now my default cooking and serving souring agent. No side by side test against our dayap either but thatâ€™s alright since they say our smell memory is precise and enduring. Exact same flavor Iâ€™d say although I find that key limes seem a lot smaller than the average dayap from memory and easier to squeeze the juice from. A simple slice along the equator is all that is needed whereas with our dayap, it took three tangential sections (Chrisb’s pisngi) to draw as much juice as there was from the tight and hard to squeeze fruit. Maybe it has genetically gone softer since its displacement from Southeast Asia to Europe and then across the Atlantic to the Florida keys. Apicio, tangential sections sounds really sophisticated! haha I shall use that when describing how I cut dayap in the future. My husband bought this little gadget (lemon squeezer) kasi nga nakikita niyang naghihirap ako sa pag-piga ng lime. It works naman; sometimes lang talaga, medio tuyo yung prutas. rolling the dayap with pressure between your palm and the surface of the table … or putting them in hot water before slicing. one can still use dehydrated dayap this way. rehydrating them for easier extraction. and, difficult as it is, we try to avoid slicing through the seeds. i usually end up with 4 slices, the core would be a 5th. Haha, I thought these tangential cuts were made by mistake or were made in a hurry. Didn’t think they were intentional. I don’t remember too well how hard dayap is to squeeze, but what I do with limes is cut them into quarters lengthwise, then cut the strip of core off each quarter, opening up the sections and making them easier to squeeze. I still remember that exchange! To get 3 perfect slices you have to cut a little farther from the core. The collateral waste can be made into juice. Just put the waste cores into a shaker, add water, ice and sugar syrup, and perhaps some mint and a little vodka or gin ;) Shake vigorously like what bartenders do when making cocktails. You can also purposely cut dayap into thin slices to make this. Works well with lemons too. Easy dayap or lemon drink – no need to squeeze. HI MM! My question is totally not related to this post. I just wanted to know if dayap is our local version of the key lime. Thanks! Hi MM. This is very much off topic, but I just want to ask if you own the exclusive rights to the name “zubuchon”. It’s just that there’s this new buffet place in QC called Primero Casa Filipino that labels one of its pork dishes as “zubuchon”. People might think that it’s the one that comes from your resto. Noel Q, thank you very much for the heads up. In answer to your question, yes, we have registered the name and logo ZUBUCHON with the Philippine Intellectual Property Rights Office and own the rights to the name. It’s possible that that particular restaurant purchased their lechon from us (I do not know this for a fact) but even if they did, they would require permission to re-use our name on their buffet if they did in fact do that. Oh wow, I remembered correctly after all! Those “collateral” pieces get slices thinly in my house, with some water, sugar syrup and ice. Served on a blistering day (we are headed for MANY of these) with some equally refreshing snacks (sliced kamias/iba with a sprinkling of rock salt, anyone?) screams summer! Betchay, i’m so jealous! Have been looking for a lime seedling that i can grow in a giant pot. @Millet: if you were my neighbor, I will gladly give you a steady supply! Our dayap tree is about 4 years old and probably has reach its maturity thus the abundance of fruits.I just bought the seedling in one of the Weekend markets….never really took care of it after I planted it in one corner in the garden but since late last year it has been bearing a lot of fruit. over the years, what I do to get as little of the core piece is to cut as close as I can starting at the stem end but not right along the stem end…a vertical cut…this is what I do with oranges as well. The last piece you cut will have just the section with the core…then cut the core! if I have to juice say about 50 limes…then the microwave trick that EJ mentioned works. Using my very , very, very old electric juice extractor hubby bought about 20 years ago which still works, does the job of extracting the juice. EBBA …go get one at a thrift store. Yup, I shop at thrift stores but I found out that if I go to an area like West Van or Point Grey area, mga Mrs…the thrift stores in those areas have really cool stuff practically brand new at next to nothing prices esp. COPPER stuff like a set of copper measuring cups and spoons at bargain prices I couldn’t resist! Betchay…oh, How I envy you!…..juice all those Dayap Put them in ice cube trays…store them in zip plock bags….when season over, people will be asking your frozen Dayap juice cubes from you! Betchay…if you still have limes coming out of your ears after doing all the pies and cakes and cheesecakes, maybe preserved limes like the preserved lemons MM featured before or how bout LIMECELLO? Would probably make nice Christmas presents! Oh…if you know of a graphic artist like Lee perhaps, a nice label! Whoa… I can just picture it now! Betchay…forgot to tell you if you want to make non alcoholic presents for Christmas using your Dayap…make Dayap infused simple syrup, and bottle them! do you know that they sell them? I have seen bottled lemon infused simple syrup here at the open markets in the summer. Thanks BettyQ for the ideas….the frozen juice,syrup however I am not into alcoholic drinks so I will pass up on that Limecello :) I am thinking of a dayap butter/dayap curd to spread on freshly baked scones! Oh, no….if I was your kapitbahay, Betchay, and you won’t use the lime rind, I will ask for the lime peel after you have squeezed the lime juice for your curd! I am not into alcoholic drinks either but I just like making them to give away as hostess presents! Do you use lemon pepper! You could make lime pepper as well with the zest…season your Thai curried chicken with lime pepper. Do you prefer light, fluffy scones? If you do, the secret lies on the type of flour besides not overworking the dough. Use cake flour instead of all purpose flour. Even if you eat them the next day, it will not turn to a hockey puck! Betchay…LIME SALT using flakey sea salt…baked with the zest till dry! Store in nice little glass jars or bottles…another execellent hostess gifts! Use as finishing salt. For lime pepper…use white peppercorns. I don’t know if its just my brain that’s not working right now	.. I cant seem to figure out how to do that kind of cut, though i don’t like the smell of those citrus fruits but I sure like to learn this trick. i will try it later.. thanks for the tip again Mr. MM.. you’re simply the best!!!!! Marketman, to get the most juice from your dayap, try doing what we do in Negros Oriental with our suwa. Peel the middle part, along the equator as it were, of the fruit. Slice it along the peeled part; somehow the squeezing is easier and more productive. ayy… ang dami na namang ideas ni Ms. Betty Q. Sayang, ang dami kong naitapon na “georgous” wine bottles, sana naibigay ko na lang sa iyo. BettyQ, you are a treasure trove of ideas! I like your idea of lime salt and lime pepper :) and thanks for that tip on baking light fluffy scones…..am going to the kitchen right now! Betchay, thanks for the thought. will hunt for a dayap seedling here.